Coleman first described Acleris celiana in 1869 under the name Teras celiana. “Anterior wings rich dark chocolate-brown slightly mottled with dark gray. There is a tuft of pale ochreous scales on the center of the disk, and beyond, in the apical portion of the wing a few scattered similarly colored raised scales. Fringes gray.” There is no mention of the white band. However, both Bug Guide and MPG show specimens of Acleris celiana with and without white bands. I’m leaning strongly towards Acleris celiana on this one. Finding Ancylis albacostana would be great but the species is not, as far as I know, documented from Minnesota although there is at least one record from adjacent Wisconsin. As for the rest of Monday night’s mothing, I found three more moth species and got a very clean shot of the caddisfly Glyphopsyche irrorata. Two of the moths are in Agonopterix (possibly A. canadensis and A. clemensella) and one is another Acleris (possibly Acleris forbesana). And now it is 10:10 PM Tuesday night and I’m staying up late looking for more moths. So far I have two new ones to figure out. Kearfott, William Dunham (1905). Descriptions of New Species of Tortricid Moths From North Carolina, With Notes. Proceedings of the United States National Museum, Vol. 28: 319-364. Description on page 360. Robinson, Coleman, T. (1869). Notes on American Tortricidae. Transaction of the American Entomological Society (1867-1877). Vol. 2 (1868/1869):261-288. Description on page 283-284. Genus Ophion – Short-tailed Ichneumon Wasps at Bug Guide. Species Acleris celiana – Hodges#3533 at Bug Guide. 620033.00 – 3533 – Acleris celiana – (Robinson, 1869) at Moth Photographers Group. The insect above is a caddisfly and one of many caddisfly species that live in northern Minnesota. 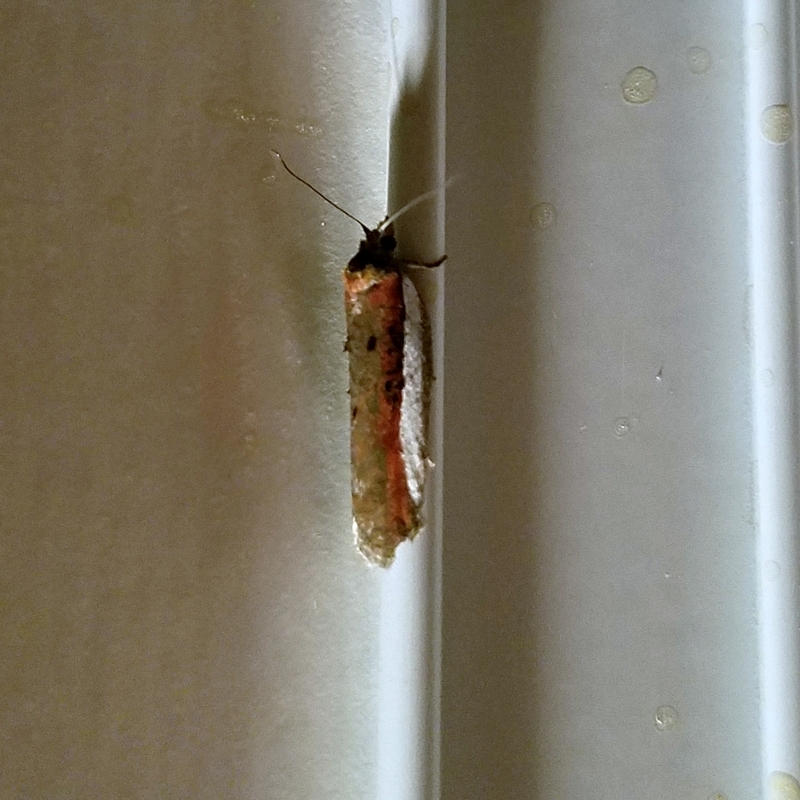 Caddisflies (Order Trichoptera) are typically active during the warm months of summer and early fall but this caddisfly was active on the evening of April 25 when air temperatures were in the low 40s. It took me about a couple of days to figure out the species after searching Bug Guide and comparing photos (compare the pattern on the ends of the wings with this) and then doing a literature search. This caddisfly is Glyphopsyche irrorata which is in the Family Limnephilidae and is interesting for a few reasons the first of which is its mode of surviving the winter. 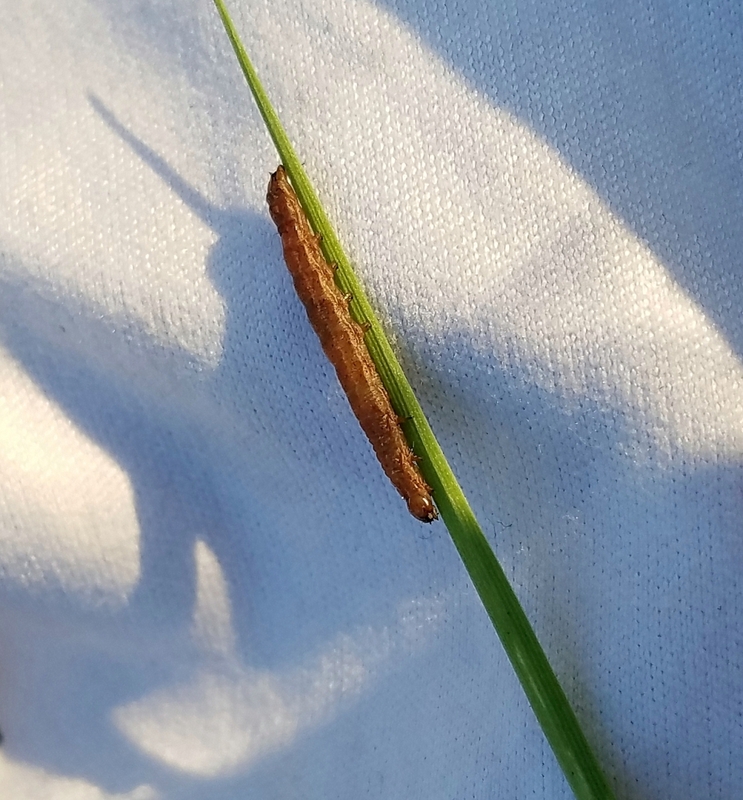 Larval G. irrorata live in small ponds such as vernal pools and peatland ponds, shallow marshes, and slow moving streams that may dry up by the end of summer. Many caddisfly species in similar habits lay eggs in gelatinous masses under moist objects in the drying water body where the larvae remain until favorable conditions return. G. irrorata has a different survival strategy. It goes through a rapid larval development after the eggs are laid in May, pupates in August, and emerges as an adult in September. Mating takes place in the autumn and then the adults go into hibernation until the following spring (more mating may take place then) when the females lay eggs in small ponds and slow moving streams. The larvae build cases from bits of organic material and mineral material and are detrivorius shredders feeding on decaying wood and other organic matter. Another reason G. irrorata is interesting, at least from the standpoint of where this one was found, is that this species has been recorded only twice in Minnesota in 41 years. The first time was in 1977 in Clearwater County and the second was in 2000 in Cook County. This sighting makes the third time and in a new county. Although not on Minnesota’s rare species list it must be uncommon to have only two previous records in the state. This is in spite of several caddisfly surveys conducted in the state in the last 20 years. The range of G. irrorata is Nearctic extending from Newfoundland to Alaska and south to California, in the Great Lakes Region and then east to New Hampshire and Maine. The number of known sites where G. irrorata occurs in Wisconsin, Michigan, New Hampshire, and Maine are few. G. irrorata is attracted to lights as are many caddisflies. It is also attracted to sweet liquids like maple sap in tapping buckets. Many caddisfly species that fly during the summer are nectar and sap feeders, too. Using a combination of lights and sweet liquids might be a way to attract this species. 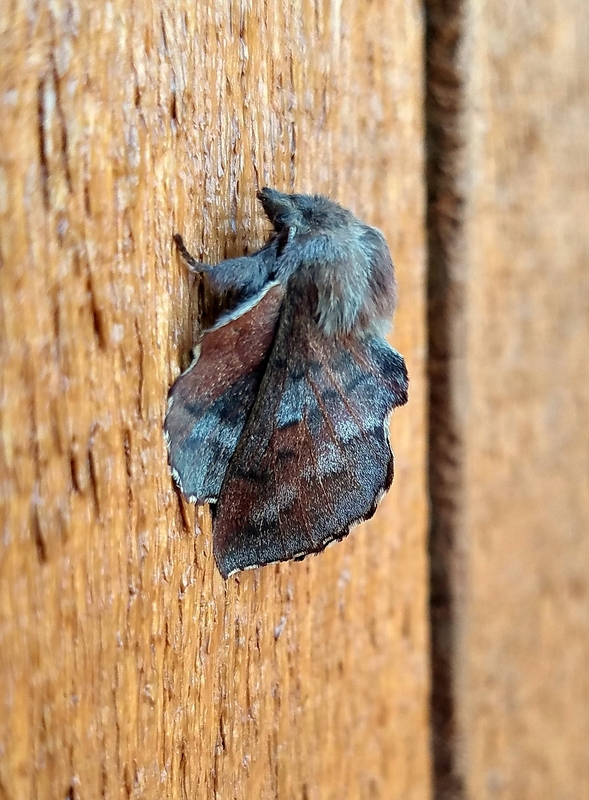 The forewings are grayish chocolate-brown with small spots and many larger translucent patches. Length is about 16 mm. Berté, Stephen B., and Gordon Pritchard (1983). The Life History of Glyphopsyche Irrorata (Trichoptera, Limnephilidae): A Caddisfly That Overwinters as an Adult. Holarctic Ecology, Vol. 6, No. 1: 69-73. JSTOR, http://www.jstor.org/stable/3682718. Betten, Cornelius. (1934). The caddis flies or Trichoptera of New York State, Bulletin of the New York State Museum No. 292:1-576. Casey Scott and Jeffrey Dimick. A Distributional Atlas of Riffle Insects from Wisconsin Streams. Aquatic Biomonitoring Laboratory, University of Wisconsin-Stevens Point. 437 pp. © 2010. Chadde, Steve W., Shelly, J. Stephen, Bursik, Robert J., Moseley, Robert K., Evenden, Angela G., Mantas, Maria, Rabe, Fred, and Heide, Bonnie. Peatlands on National Forests of the Northern Rocky Mountains: Ecology and Conservation. 80 pages. United States Department of Agriculture, Forest Service, Rocky Mountain Research Station. General Technical Report. RMRS-GTR-11 July 1998. Houghton, David C. (2012). Biological diversity of the Minnesota caddisflies (Insecta, Trichoptera). ZooKeys, Vol. 189:1-389. doi: 10.3897/zookeys.189.2043. Majka, Christopher G. (2010). Insects attracted to Maple Sap: Observations from Prince Edward Island, Canada. ZooKeys Vol. 51:73– 83. doi: 10.3897/zookeys.51.478. Nimmo, Andrew P. ( 1971). The adult Rhyacophilidae and Limnephilidae (Trichoptera) of Alberta and eastern British Columbia and their post–glacial origin. Quaestiones entomologicae, Vol. 7:3-234. Species Glyphopsyche irrorata at BugGuide.Net. UNH Insect and Arachnid Collections – Record Detail Glyphopsyche irroata. University of New Hampshire Department of Biological Sciences. Wiggins, Glenn C. and Parker, Charles R. Caddisflies (Trichoptera) of the Yukon, with Analysis of the Beringian and Holarctic Species of North America, pp. 787-866 in Danks, H. V. and Downes, John A. (Eds. ), Insects of the Yukon. Biological Survey of Canada (Terrestrial Arthropods), Ottawa. 1034 pp. © 1997.